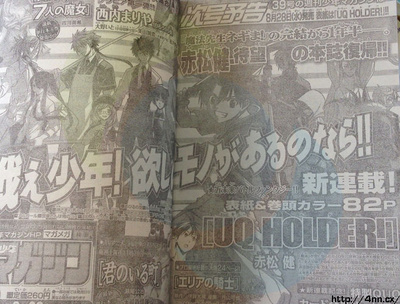 It’s called “UQ Holder!” and it will be feutured on Shukan Shounen Magazine No 39. It will have a first chapter with 82 pages and front colors! They are putting quite the confidence on this title. It is being rumored of being in the same universe as Mahou Sensei Negima, but this time being all about Shounen Battles since the beginning. This entry was posted in News and tagged Manga, News. Bookmark the permalink.